Today was such a productive day, and productive days are my favorite days. I landed a solid internship, got some killer deals, and still managed to run 5 miles, negative splits all the way. I attribute my success to my lucky cheetah palazzo pants (my obsession). 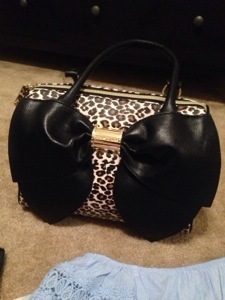 I love anything cheetah or leather, or preferably both, so when I found a Betsey Johnson purse that was cheetah, leather, AND had a bow on the front, ON SALE, I was in heaven. I also managed to make it out with some awesome hot pink running tights, two running tanks, an awesome light blue crop top and some adorable floral shorts. Not to mention I got my favorite bronzer for half price–so I got two. Maybe I went a little overboard, but hey, I was just celebrating. I also got to have lunch at one of my favorite restaurants so I had some amazing salmon with steamed veggies. Breakfast was an egg scramble with mushrooms, bell peppers, spinach, and sun dried tomatoes with half a grapefruit (I think I’ll start calling this one breakfast of champions, haha). Seriously, do not underestimate the power of a good breakfast. It keeps you focused, it gives you energy, it helps keep you from overeating throughout the day, and who doesn’t love breakfast food? I mean I love pancakes and bacon as much as the next person, but even healthier options like this egg scramble are scrumptious and satisfying. Fat girl confession: I look forward to breakfast at night before I go to bed, sometimes I even dream about it. No shame. What’s your favorite breakfast recipe? Even better–best paleo breakfast recipes anyone? Dinner was Mango Crockpot Chicken from PaleoPot. Not gonna lie, this wasn’t my favorite paleo creation, but it’s super easy. You know what else is super easy? Brinner (Breakfast for dinner). Yet another reason it’s my favorite meal of the day and I will eat it as much as it deserves to be eaten. A note on yesterday’s post–just because it’s hard, or I’m not seeing results doesn’t mean I’m going to stop doing what I’m doing. I could have skipped my run today or pigged out on some creme brûlée at lunch (and trust me I love me some creme brûlée), but I didn’t, and I’m so happy for it. If you have to reward yourself, do it. But whatever you do, don’t quit.